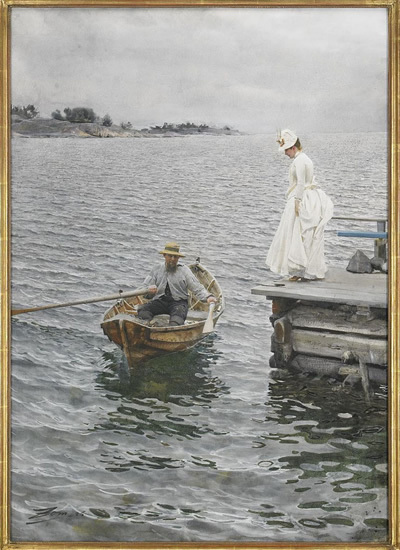 Photo: An Anders Zorn painting that sold for 2.6 million euros excluding commission. 26,000,000 SEK excluding commissions (2,600,000 euros) was paid for the masterpiece Sommarnoje by the Swedish artist Anders Zorn at Stockholms Auktionsverk in Stockholm. This is a world record for a Swedish artist and the highest price ever paid at an auction in Sweden. This watercolour was painted in 1886 at Dalaro. • Anders Zorn is considered one of the world's foremost watercolor painters and his skills depicting the variations and reflections of the water's surface are unsurpassed in this very difficult technique.